In the early morning of January 4, 2016, I sat numbly next to the complimentary breakfast bar of the Comfort Inn in Ponca City, Oklahoma. It was the eighth day of the search for my brother Craig’s body. Through the window, I could see Craig’s icy red pickup truck covered in Arkansas River mud. This was my eighth tiny box of Cheerios at the start of w­­hat had strangely become another routine day. I waited on the rest of my family to get dressed for the freezing conditions. We had planned to search on our own as our frustration grew. It was far too hard to sit idly by as the authorities searched for the big brother I had known from birth. Our small group consisting of my father, my husband, and my sister-in-law gathered at the tiny table and laid out our plan of action as we waited for Craig’s best friend, Hunter, who was coming into town and was ten minutes out. The plan was to look for Craig on the sloped, wooded riverbank down to the shore. We knew from Craig’s excited, Christmas Eve description of his plan that he and Chase wanted to try to park near a house on the west side of the Arkansas River where it flowed into Kaw Lake. The house was visible on Google Earth and looked like the perfect access point. This spot was on the opposite side of the river from a public access point where they eventually launched. The west side would have provided much safer access to the usually wade-able portion of the upper lake. However, as our little search group would find out, this was thru private land down steep areas and thru heavy forage. We became serious in our thinking that Craig must have exited the water because the muddy riverbed had been thoroughly searched with sonar and the uncanny noses of rescue dogs. The authorities seemed to be convinced, logically, that Craig was at the bottom of the lake. We were not convinced to follow the same logic the authorities were following, we knew Craig. He was a freak athlete, a good hunter, and a strong swimmer. The conventional wisdom is that a person will sink to the bottom of a body of water if his or her waders fill with water. Our friend Garthe showed us (in the hotel pool, no-less) that insulated, neoprene waders were buoyant and would have helped Craig to float, so we decided Craig must have swam to shore. Armed with this knowledge, we were confident in our plan to search the western shore on foot. We drove to the house Craig had shown us on his iPhone the last time we saw him. We parked on the road, well uphill of the water and hiked through the thick brush and flotsam until we finally reached the edge of Kaw Lake. The water was ringed with a crust of ice and the ducks and geese were flying past us in droves. Craig would have been so excited and would have been naming each species. My dad walked with Helen, Craig’s wife, and Hunter to the north, while my husband and I decided to walk south. Our plan was to search for an hour or so and then meet back at the starting point. My father, Helen and Hunter walked for about an hour when they heard someone approaching. 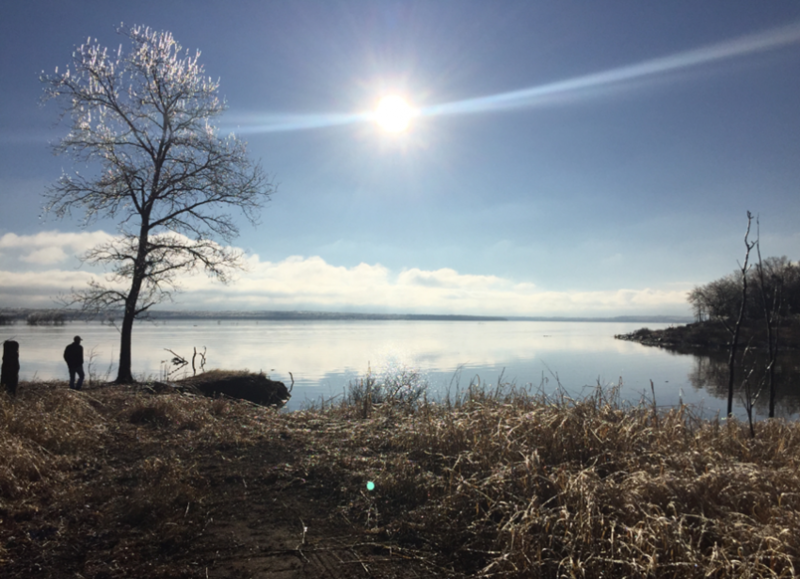 The stranger turned out to be a Highway Patrolman who had just traveled in the boat across the lake in the frigid conditions and had asked to be put ashore to warm himself. It was his first day back from vacation and he knew almost nothing of the situation. My father was walking along about 30 feet from the shore, ten feet or so inside the tree line. He was probably on a direct path to where Craig’s body laid. He heard Helen and Hunter talking to someone, which caused him to drop down from his spot to the shoreline. After introductions, the patrolman kindly offered to accompany my father and they trudged westward through the harsh terrain. Helen and Hunter wanted to rest briefly and my father and the patrolman continued together. They walked just a little way up the hill and came across a newly strung barbwire fence, not too far from the shore. They decided to walk along it, reasoning that it would have been very difficult to climb if Craig had come to it in the dark. The two men split up, the officer going north and my father walking south. Within just a few steps, the highway patrolman located some clothing on the barb wire fence circled his eyes around and saw my brother’s camouflaged figure lying under a cedar tree. He looked back at my dad and wisely chose not to call out to him. Instead, he quietly knelt next to my brother’s body and radioed to his commander. At the same time, my husband and I were walking with several other searchers (friends from Arkansas), oblivious to the events that were taking place to the north. Minutes before I received that fateful phone call from my dad, I looked down and found an antler on top of the brown leaves that a buck had shed the previous season. 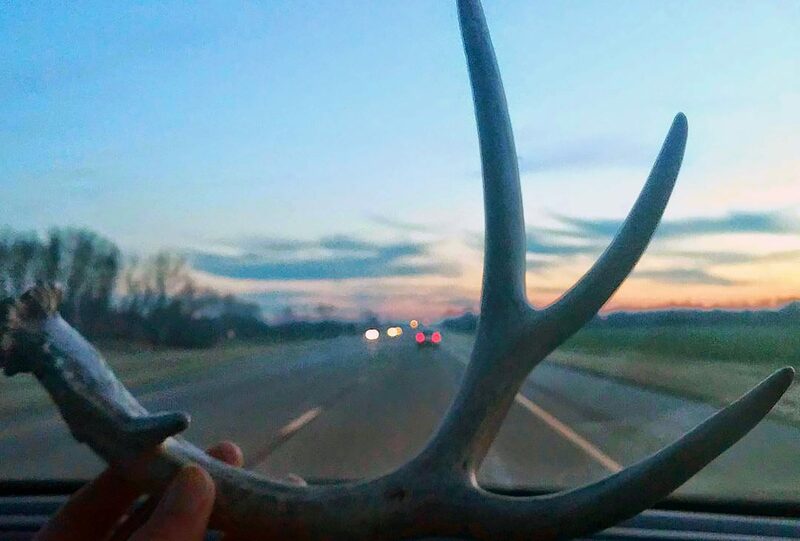 I will have to explain the significance of this find: During the wonderful Christmas we spent with Craig in Fort Smith, he had promised to give me a new deer antler for my dog. It sounds silly, but the dog is a serious chewer and loves antlers. Craig felt so bad that he had forgotten and promised that he would get me one soon, even if he had to mail it to me. That promise was fulfilled as I stumbled through the gray brambles and brush that day. Looking back, I must have found that antler at almost the exact time that my dad looked up to see the beautiful snowflakes; the same time that the officer found Craig. Only God could love so intimately and so intentionally. There were so many incredible blessings that were unveiled in those short moments. First, Craig was found and everyone got a bit of bittersweet closure. Hunter, Craig’s loyal friend, mercifully volunteered to identify Craig’s body so that his family did not have that image as our final memory of him. The highway patrolman’s timing was nothing short of miraculous. Had he not been there, it is entirely probable that my dad would have been the one to find Craig. Helen also could have easily been the one, as she was resting mere feet from his body. January 4, 2016 around 11:45 am, our whole family was all together, either at the command center or on that shore of Kaw Lake. God’s incredible timing for all of this to be orchestrated is beyond coincidence, it’s the providence of God. God did not abandon us or Craig, for he created us, but rather he worked within that creation to manage all things according to His own will. When the fullness of Craig’s testimony had been shared around the World, Craig was found. Craig’s legacy continues on! We are excited to continue his legacy through the Craig Strickland Foundation, supporting campaigns that match his passions. To God be the glory. Beautifully written Katie. Beautiful, Beautiful! God is so faithful. What a testimony to the faith you have in Jesus. Thank you for letting your light shine for the world to see at such a heart breaking season in your lives . Such a wonderful testament of Gods amazing love and timing. Also to your brother Craig. A life short lived, A life fully lived! Katie, thank you for sharing your beautiful account of 01/04/16 and your wonderful 1 spirit and faith! I am Julie’s late husband’s first cousin and I have marveled at the strength of your family and been inspired by each of you! Thank you, again. Thank you for sharing! Keeping you and your family in my thoughts and prayers. Beautifully written and such an honest and mature-of-faith story to show God’s mercy when it would be just as easy to be angry and full of doubt of God’s unending love for us. Thanks for sharing your story. Craig was a blessing to Dorothy Roy and our family. He was always so kind, enthusiastic and fun to be around. I can’t imagine the pain yall have had to go through, but am thankful that somehow in the midst of this tragedy, you saw God every step of the way. May God continue to strengthen and encourage your family. Thank you for sharing this with us. Craigs love for the Lord reflects in the many stories shared from those who knew and loved him most. God bless you. Saying a prayer for you all, this is still very fresh in my mind. Craig was a dear man and your loving tribute to him is so evident. God is good! Thank you for sharing this story of God’s grace & comfort in the most horrible circumstances! May God continue to bless & comfort you & use you as a bold witness that bad things happen to God’s children & that God never leaves or forsakes us! Wow.. thank you for that. God’s provision is perfect. Craig is not forgotten even though I was just a classmate. I just mentioned his name tonight to my mom before seeing this post.